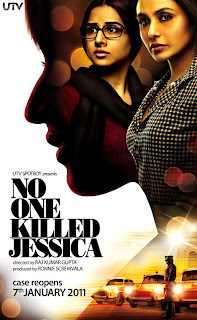 Prior to the release of No One Killed Jessica tinselville was filled with talk of women oriented subject not fairing well at the box office in India. But, two weeks after its release the film is proving its skeptics wrong by earning Rs. 27.15 Crores and still going strong. Considering that only two other Rani Mukherjee films have ever crossed 25 crores at the box office I would say that's pretty good. So, what is the reason for the success of NOKJ? Well several factors come into play, but the most logical is the fact that it's the first Rani Mukherjee film to release since September 2009. Her fans have been waiting a long time to see her on the big screen again. Also, this is the first time Rani Mukherjee and Vidya Balan will be seen together on the big screen. Another reason is it's not really a woman oriented subject, the film is based on a social issue more than anything else. Plus the film has gotten rave reviews from the critics. Add to this a good soundtrack and the film is bound to have a successful run.